Update: The stream is over and all of Blackrock Mountain's cards have been revealed. We'll update our review gallery with all the new additions tomorrow, but until then you can watch everything you missed in this VOD. You can also see pictures of all the Blackrock Mountain cards on Hearthstone's Facebook page here. Original: We've seen 17 of the 31 cards that will be added to Hearthstone in its upcoming Blackrock Mountain adventure, but we're about to see all the rest. 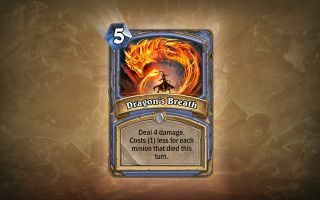 Ahead of its release this Thursday, Blizzard has decided to host a livestream today at 10am PDT where it will reveal the last 14 cards and play a few games with brand new decks. Watch the stream embed above to see all the newest cards. Tim and I have been keeping track of all the cards announced so far, and you can read our opinions of them here. We'll update the gallery with thoughts on the new ones before Blackrock arrives.